CFA (Country Fire Authority) are looking for candidates to join Victoria’s fire and rescue services. Applications open on Friday 8th February 2019 at midday. They will be accepting 3600 applications, however they expect places to fill very quickly and encourage anyone that is interested in applying to submit an application as soon as recruitment opens. You can only submit one application per person. Any individual who submits more than one application will be disqualified. You must be an Australian citizen, permanent resident or a New Zealand citizen who has entered Australia on a valid passport. You must have held your driver’s licence for two years by the 1 June 2019 (this does not include a learner’s permit). Green probationary licences are acceptable. Applicants who have incurred eight or more driving demerit points at the time of their application and at any stage up to an offer of employment will be disqualified. You must comply with the criminal history and driver history policies. Please refer to these policies to check your eligibility. All applicants need to undergo a National Police Record Check. Medical clearance: All applicants are required to obtain a medical clearance from their doctor prior to undertaking the physical assessment components of the selection process. Prior to all job offers, a thorough pre-employment medical is conducted by the Brigade Medical Officer. Once applicants receive an offer of employment they will be required to obtain a Heavy Rigid licence. Further details will be provided with your offer of employment. CFA applicants must be prepared to be stationed at any of CFA’s integrated stations on completion of the recruit course. Although your preferences are taken into consideration, CFA ultimately makes placement decisions based on operational need. The shuttle run / beep test, also known as the multi-stage fitness test, 20m shuttle run or bleep test has always been one of the harder test that potential recruits struggle with when applying to join the Fire brigade. Over the years we have trained a huge number of clients who were wanting to join one of the Emergency Services (Police, Fire Brigade, ADF) and each and every client has had the same question. How Do I Improve My Beep Test! Current Standard: Level 9.06 – 78 shuttles and is 1560m and 9 minutes and 02 seconds of running. So what is the Beep Test? The beep test is used to estimate your maximum oxygen uptake better known as VO2Max. The test involves running continuously between two points that are 20 metres apart and you must time your running speed to match a pre-recorded audio tape, CD or laptop which plays beeps at set intervals. As the beep test proceeds, the interval between each successive beep reduces, forcing the runner to increase their speed between the shuttles, until it is impossible to keep in sync with the recording. The test finishes when participants either becomes too tired and stops running or they record two consecutive misses at reaching the lines in time for the beep. Are you planning on putting in an application? We would love to hear your thoughts below? 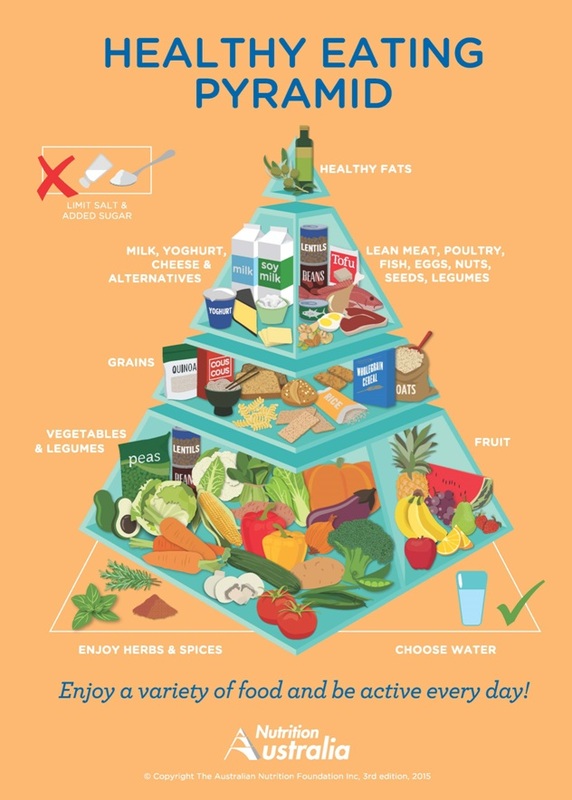 Today Nutrition Australia has released the latest version of the “Healthy Eating Pyramid” for Australians. The ‪#‎newpyramid‬ is here, in an effort to combat growing nutrition confusion and risky fad diets. One of the positive changes is that there is a greater emphasis on fresh vegetable (mostly) and fruit intake which is now at the base of the pyramid. Grains, cereals and other starchy carbohydrate foods now have a smaller representation on the next level up. Vegetables now occupy the largest space and herbs and spices are included as well which is great. It also puts healthy fats at the very top of the pyramid which could be seen as a good thing. At least now people know to MONITOR their fat intake, as it contains almost TWICE as many calories per gram as protein and carbohydrates (yes even the “good fats”), rather than just avoiding fats altogether. They have also made the distinction between sugar and ADDED sugar, saying the latter along with high salt intakes is the one to avoid. The Pyramid is never going to fit EVERYONE in the population, but it can be a good place to start for those who have no idea about nutrition. If you read the Qualia Review you will learn that we are all unique and our body’s needs are all individual so there will never be a perfect food pyramid that suits everyone’s nutritional beliefs – but promoting more veggies can only be a positive thing. Hopefully this can bring some positives changes that affect the growing obesity and health crises in Australia. 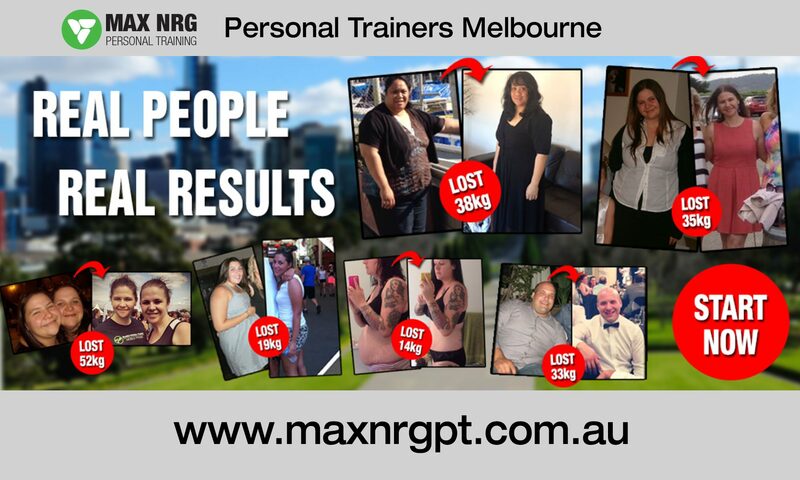 MaxNRG Personal Training now has a mobile fitness trainer Pia Marshall operating throughout Port Melbourne and the surrounding areas, so if you hate going to the gym, we’re the best solution for you. Pia is a great female personal trainer, and runs 1 on 1 personal training, boot camps and corporate fitness programs. Pia is a fun, energetic mobile personal trainer in Port Melbourne, VIC 3207 and is the perfect fit if you are looking for a female personal trainer near Port Melbourne. Pia not only trains small and large corporate groups, or boot camps, but has worked extensively 1 on 1 with females to help them achieve weight loss and improve overall fitness and health. 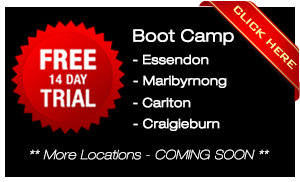 Corporate Fitness Training – Do you own a business in Port Melbourne or you work for a company located near Port Melbourne? Our MaxNRG corporate fitness program ensure to shift your staff out of their chairs and into shape! Increase the morale and productivity of your staff by beginning a corporate fitness program. Pia services the following areas near Port Melbourne: Port Melbourne, South Melbourne Albert Park, St Kilda, Prahran, Windsor, Elwood, South Yarra, Richmond, East Melbourne, North Melbourne, Docklands, South Wharf, Fitzroy, Parkville, Collingwood and the other inner suburbs around Melbourne. How’s this for Motivation & Inspiration! Tom suffered from a stoke at the age of 12 and was diagnosed with having Arteriovenous Malformation. Tom has given himself a big goal of completing the Kokoda Track whilst raising funds for The National Stroke Foundation. Take a look at his story and help Tom achieve his goal. At the young age of 12 I woke up one morning with a headache… 5 weeks and 2 days later I came out of an induced coma and was diagnosed with having a Arteriovenous Malformation. In shorter terms I had suffered from a stroke and my life had now changed forever. Throughout my teenage years I lacked motivation and was finding hard dealing with my condition. However, in the last 3 years I have changed my mindset and set many goals that I want to achieve. One of those being conquering the Kokoda Trail. Thank you in advance for your support. Tommy. The National Stroke Foundation is a not-for-profit organisation that aims to stop stroke, save lives and end suffering and is the only national charity dedicated exclusively to stroke. Victorians are being urged to make small steps towards better health. The state government has recently launched a new “Healthy Together Victoria’ campaign which aims to improve people’s health where they live, learn, work and play. People should start with small achievable changes, such as adding a few extra veggies to their meals, or cutting down on the amount of processed food they eat, or getting outdoors and exercising on the weekend. Healthy Together Victoria focuses on addressing the underlying causes of poor health in children’s settings, workplaces and communities to strengthen Victoria’s prevention system. The focus is on encouraging healthy eating and physical activity, and reducing smoking and harmful alcohol use. The initiative is jointly funded by the State Government of Victoria and the Australian Government through the National Partnership Agreement on Preventive Health (NPAPH). As children and young people develop the knowledge, skills and behaviour for lifelong health and wellbeing, preventive efforts focused in the early years of life are likely to be effective and long-lasting. The benefits of healthy workplaces reach far beyond individual workers, influencing the health of families and communities. Behind every successful business is the hard working loyal employees who work within it. A healthy workplace also reduces sick leave and staff turnover and increases productivity and participation. One of the best ways for improving employee job satisfaction is a Corporate Health and Fitness Programs that aim to increase each staff members quality of life. Through the National Partnership Agreement on Preventive Health (NPAPH), the Australian Government is delivering national initiatives that complement the work underway in Victoria. These are underpinned by a joint statement by the Australian Government and peak employer representatives and unions demonstrating their commitment to improving the health of the population through workplaces. There is also a Healthy Workers website which has the latest tools, resources and guidance to support employers develop health promoting workplaces and an awards program. Another option is our Melbourne corporate fitness programs that are flexible and adaptable to both your organization and employees needs. By tailoring the exercise program to your company’s specific needs we are able to provide you with an opportunity to improve your workplace that is both effective and affordable. Our corporate fitness programs can include private 1 on 1 consultations, group exercise sessions, boot camp programs, education on nutrition and guidance with healthy food plans as well as ongoing fitness appraisals and assessments. Healthy Together Victoria also aims to create links to health promotion and prevention services and programs underway across the state, such as Premier’s Active Families Challenge, Ride2School, WorkHealth and Life! Healthy Together Communities are operating in 12 areas across Victoria. In these areas, local governments, in partnership with community health organisations, local stakeholders and communities, are leading comprehensive local efforts to support the development of a local prevention system. 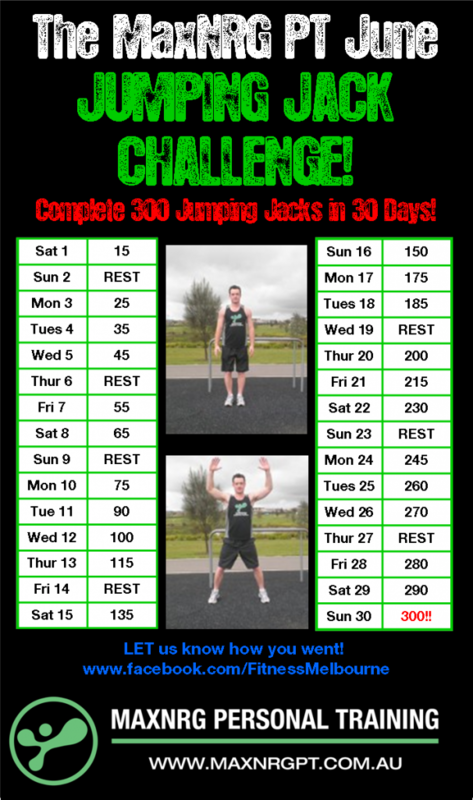 The MaxNRG PT JUNE Jumping Jack Challenge! Introducing the first of many fitness challenges that you can do in your own home in a matter of minutes. This is a great opportunity to set yourself a goal and challenge yourself. Can you reach the 300 repetition mark in a month? Having no time to exercise is no excuse as doing 300 jumping jacks should not anymore then 5 minutes together. Whats a Jumping Jack (also known as a Star Jump)? ARE YOU UP TO THE CHALLENGE!? Stay tuned for next months challenge! GOOD LUCK! The Team at MaxNRG Personal Training aim to provide you with weekly healthy recipes which include breakfast, lunch, dinner, smoothies and the occasional dessert recipe idea that will not only revive your taste buds but take you a step closer to reaching a leaner, healthier you! Previously we gave you two tasty side dish recipe ideas – Mashed Cauliflower and Grilled Asparagus and now try this weeks delicious Soup recipes. 1. Rinse and chop the onion and peppers. 2. Peel the garlic and give it a rough chop. 3. Heat a cast-iron pan over medium heat with 1 teaspoon coconut oil. 4. Sauté the onion and garlic until the onion starts to turn translucent. 5. Transfer to a large soup pot. 6. Sauté the peppers for 3–5 minutes to give a slight char. 7. Add to large soup pot. 9. Add to large soup pot. the peppers and the onion. 12. Cover, reduce heat to low, and simmer for 3–4 hours. 1. Rinse and chop all vegetables. 2. Place vegetables to cover the bottom of a crock pot dish. 4. Pour in two cups of beef broth, and sprinkle salt and pepper over the top. 5. Place lid on crock pot, and cook on low for 6–8 hours. continue to cook on low. To view more of our simple and healthy recipe ideas please visit our Recipe Page. 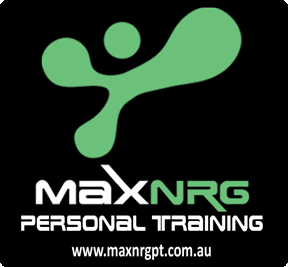 For more information about how MaxNRG Personal Training can assist you with your diet and fitness needs check out our Nutrition page on our website. Previously we gave you two tasty Breakfast recipe ideas – Bacon & Eggs and Breakie Burrito and now try this weeks delicious side dish recipes. 1. Rinse cauliflower under cool water. 2. Trim florets from the base of the cauliflower. 5. Steam cauliflower until fork tender. 7. Place steamed cauliflower into a food processor or high speed blender. 9. Add a tablespoon of butter or coconut oil. 10. 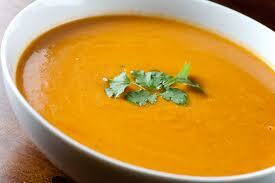 Puree until smooth, and serve. 2. Rinse asparagus under cold water. naturally snap.. Discard bottom portions. 4. 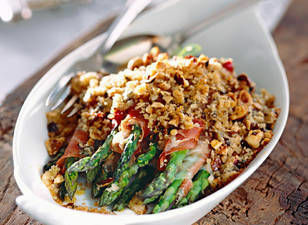 Toss asparagus spears with melted coconut oil. 7. Grill for 5 minutes, rolling occasionally to cook evenly. 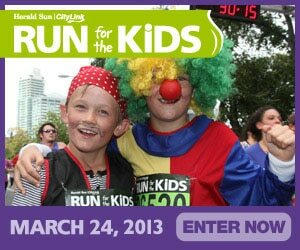 It’s time for everyone to sign up for the main fun run event in Melbourne for 2013. That event of course is The 2013 Herald Sun/CityLink Run for the Kids. This is the biggest fun run event in Melbourne each year and helps raise money for the Royal Children’s Hospital Good Friday Appeal. In 2013, we hope to raise more than ever for the Royal Children’s Hospital Good Friday Appeal. Every little bit helps provide the Hospital with funds for new equipment or facilities. Giving on Good Friday – ‘that they may grow’ is a Victorian tradition, with television sets tuned in to the 18 hour long telethon; perhaps for the chance to hear a special donation read out, or to learn of the miracles that happen at the hospital. It is all about helping those who are our smallest and most vulnerable. The great strength of the Appeal lies with the thousands of people from all walks of life, who volunteer their time, expertise and creativity to organise fundraising activities throughout the year. It is a non denominational, non political organisation that exists solely to raise funds for The Royal Children’s Hospital in Melbourne. 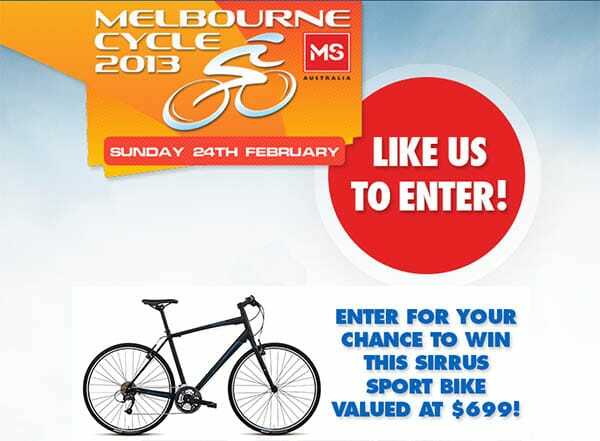 MS Melbourne Cycle is a perfect opportunity to get on your bike and show your support for people living with Multiple Sclerosis, a disease that effects over 23,000 Australians. As a proud supporter of the MS Melbourne Cycle, we encourage all of you to visit their website and register for great cycling event. Choose the 50km course or the family friendly 25km option. Both courses allow you to enjoy the ride over Melbourne’s Westgate Bridge!